eve massacre (Nürnberg) ist Künstlerin, Veranstalterin, Autorin, DJ. Sie bloggt auf evemassacre.de (englisch) und breakingthewaves.de (deutsch), veröffentlichte u.a. in Testcard und bei Radio Z, war Teil des socialmediawatchblog.org Kuratierungsteams und hält Vorträge. Ihre Themen sind Digitalisierung/Social Media, (Pop-)Kulturelles und Sozial-Politisches mit Fokus auf Queer-Feministisches. eve massacre (Nuremberg) is artist, promoter, author, dj. She blogs at evemassacre.de (english) and breakinthewaves.de (german), she has published in testcard and worked for Radio Z, was part of socialmediawatchblog.org's curation team and she does talks. Her topics are digitalization/social media, (pop) culture and social-politics with focus on queer-feminism. 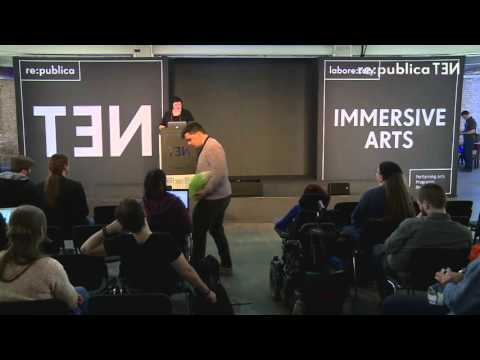 re:publica 2016 – eve massacre: VR und Kunst - Anything goes? Warum es sollte. VR und Kunst - Anything goes? Warum es sollte.